A supraglacial lake over the Greenland ice sheet in the Kangerlussuaq area at 1500 m elevation photographed on July 21, 2012. The lake feeds a stream that will deliver meltwater to the low elevations where it will either flow to the ocean on the surface or it will dive into the ice to contribute to the development of the englacial hydrological system. The Greenland Ice Sheet is the second largest body of ice in the world. It spans over 1,710,000 square kilometers (660,235 square miles) which is around 80% of the surface of Greenland. The ice sheet is generally more than 2 km (1.24 mi) thick and over 3 km (1.86 mi) at its thickest point. The ice sheet is made up of layers of compressed snow from more than 100,000 years. It contains valuable climate data from years past. Scientists have drilled ice cores up to 4 kilometres (2.5 mi) deep. These ice cores provide information on past climate factors such as temperature, ocean volume, precipitation, chemistry and gas composition of the lower atmosphere, volcanic eruptions, solar variability, sea-surface productivity, desert extent and forest fires. During the summer (June to September), about 50% of the ice sheet's surface naturally melts. At high elevations, most of that melt water quickly refreezes in place. The melt water coming from the ice sheet that is near the coastal areas are retained by the sheet and the rest falls into the ocean. 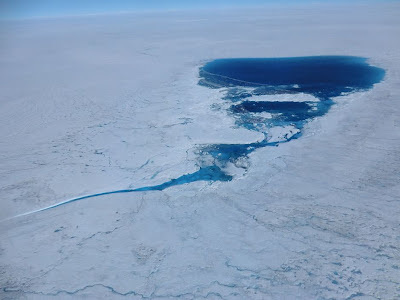 Melting over the Greenland ice sheet shattered the seasonal record on August 8 – a full four weeks before the close of the melting season, reports Marco Tedesco, assistant professor of Earth and atmospheric sciences at The City College of New York. The melting season in Greenland usually lasts from June – when the first puddles of meltwater appear – to early-September, when temperatures cool. This year, cumulative melting in the first week in August had already exceeded the record of 2010, taken over a full season, according to Professor Tedesco's ongoing analysis. "With more yet to come in August, this year's overall melting will fall way above the old records. That's a goliath year – the greatest melt since satellite recording began in 1979," said Professor Tedesco. This spells a change for the face of southern Greenland, he added, with the ice sheet thinning at its edges and lakes on top of glaciers proliferating. Professor Tedesco noted that these changes jibe with what most of the models predict – the difference is how quickly this seems to be happening. Dr. Thomas Mote, Professor of Geography at the University of Georgia and colleague of Professor Tedesco, confirmed that the cumulative melt in 2012 had surpassed that of 2010 using a similar analysis. The August 8th record differs from NASA's announcement of unprecedented melting in mid-July, reported by Professor Tedesco and other researchers. Then, they found that the Greenland ice sheet had melted over 97 percent of its surface. "That event was exceptional in the sense that it was an extremely rare event," said Professor Tedesco. "Imagine Rio de Janeiro under a layer of snow and you get the idea." The extreme melting detected in mid-July, on the other hand, generated liquid water that refroze after a few days. "This changed the physical properties of the snowpack – making a slushy layer that turned into an icy crust after refreezing – but very likely it did not add to the runoff of meltwater that makes sea levels rise." The cumulative melting index, on the other hand, does account for water flowing to the ocean. The same meltwater can affect ice dynamics by lubricating the base of the ice sheet and speeding its slide toward the sea. 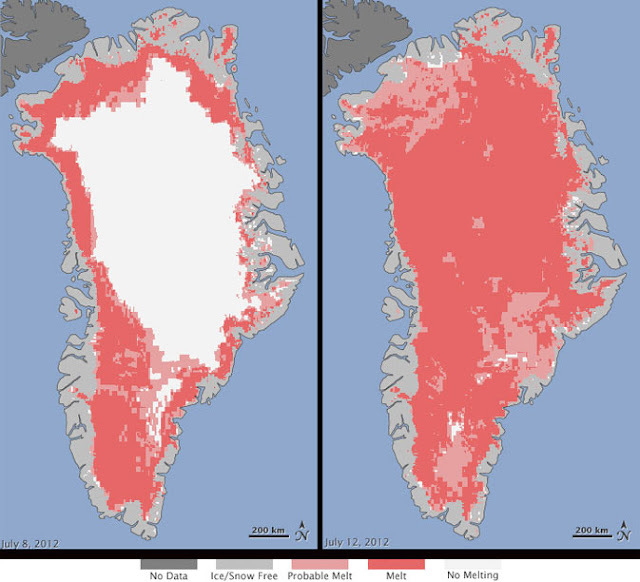 This year, Greenland experienced extreme melting in nearly every region – the west, northwest and northeast of the continent – but especially at high elevations. In most years, the ice and snow at high elevations in southern Greenland melt for a few days at most. This year it has already gone on for two months. "We have to be careful because we are only talking about a couple of years and the history of Greenland happened over millennia," cautioned Professor Tedesco. "But as far as we know now, the warming that we see in the Artic is responsible for triggering processes that enhance melting and for the feedback mechanisms that keep it going. Looking over the past few years, the exception has become part of the norm." * The National Snow and Ice Data Center provided satellite data from the United States Air Force Defense Meteorological Satellite Program.